Here is a brief introduction to heatpump defrost. In window heatpump or split heatpump unit, there is usually a function called heatpump defrost mode where the unit will automatically defrost the frost that has built up in the outdoor coils during heating operation. The defrosting of the outdoor unit need to be done otherwise it will affect the heating performance of the unit. Heatpump unit usually has cool mode which is used during summer and heat mode which is used during the winter season. 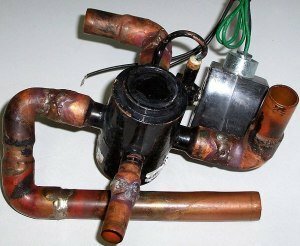 A device called reversing valve or 4 Way Valve is used to reverse the flow of the refrigerant to determine the mode that is in operation. During cooling mode the refrigerant will flow in the direction that causes the unit indoor to function as an evaporator hence giving cool air into the space. In heating mode, the reversing valve is activated that causes the flow of the refrigerant to reverse causing the unit indoor to function as a condenser and the outdoor as an evaporator. This causes the indoor to be heated up. During winter season, the unit will be required to provide heating to the room, hence you will need to operate the heatpump in HEAT mode. During this time, the reversing valve will be activated. As the outdoor unit temperature continues to drop due to the extraction of heat from it and the surrounding, frost begins to build up in the outdoor cols. Defrosting mode will then kick in when the conditions to defrost are met. In some models, auxiliary electric heater is built-in to provide heating during this time. In this case, the indoor fan will continue to operate and provide heating to the occupants. You will need to check whether your unit is installed with this aux heater. Depending on manufacturers, the conditions of going into defrosting are controlled by the microcomputer of the unit. A temperature sensor is placed at the outdoor coil of the outdoor unit and feedback to the microcomputer. A typical conditions include the followings which may differs from manufacturers to manufacturers. A timer will start when the sensor sense a temperature of 2°C to 4°C or below. After about half an hour of HEAT operation with sensor temperature below 2°C to 4°C, if the sensor temperature drops below -9°C, the defost mode will start. It will continue to run for a period of about 10 to 15 minutes or until the sensor sense a temperature of greater than 9°C. During this time, the frost will be melted by the heat extracted from the indoor. After that, the unit will automatically stop the defrosting and goes back to heating mode to continue providing heat to the room. After the first hour of HEAT operation with sensor temperature below 2°C to 4°C , it is assumed that some frost must have built-up at the outdoor unit hence the unit will go into heatpump defrost mode if the sensor sense a temperature of -5°C or below. During this time, the frost will be melted by the heat extracted from the indoor. After that, the unit will automatically stop the defrosting and goes back to heating mode. After the second hour of HEAT operation with sensor temperature below 2°C to 4°C, more frost would have built up on the outdoor unit. Hence the unit will go into defrost mode if the sensor temperature is -3°C or below. During this time, the frost will be melted by the heat extracted from the indoor. After that, the unit will automatically stop the defrosting and goes back to heating mode.